I’m 37 weeks pregnant, it’s 95 degrees F outside, and the last time I checked, the humidity was somewhere near 75 percent. My preschooler is diligently at work, determined to buckle herself into her car seat without help. My 2-year-old is gleefully jumping around the back seat, just out of my reach. I know it’s time. I can either haul my pregnant body into the back seat of the minivan, or I can employ the “mom voice.” I’m sure you know it. The slightly raised voice and the facial expression that means business. I choose the mom voice without hesitation. She snaps to attention and scurries toward me so I can lift her into her seat. As I climb into the driver’s seat, I am struck by how guilty I used to feel for using the mom voice to get obedience from my kids. In fact, when I was pregnant with my first, I totally judged other moms when I heard them being stern or raising their voice in public. Truth be told, I hated the way it sounded. I would hear a mom getting onto her toddler in Target, and cringe, wondering if she knew how she sounded when she talked that way. 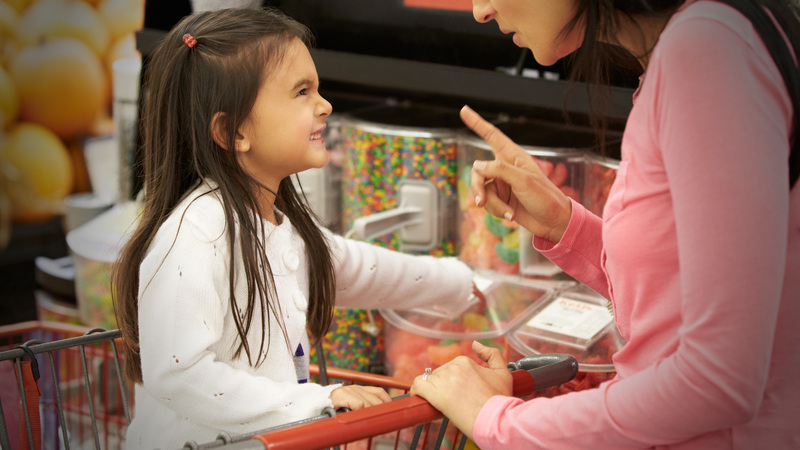 Why have kids if they irritate you so much? Surely there is a better way; couldn’t a gentle explanation accomplish more? I swore I would never use the mom voice. I had no intention of losing my cool or raising my voice, and you can bet I would never threaten my darling little children if they were disobeying. Yea, I know. Making promises about how I would parent while barely pregnant with my first is such a rookie move. I’m sure you can guess where this is headed. The change didn’t happen right away; it took some time before I got knocked off my high horse. I spoke softly and gently at all times with my crying bundle of joy who never slept for more than an hour or two at a time for a good seven or eight months. I am sure I patted myself on the back a few times, admiring my ability to stay so calm while taking care of such a difficult baby. And then, she started moving. She started getting into cabinets and finding every damn electronic device in our house. She started to hang from my pant leg while I tried to cook very hot things, and quickly figured out how to climb pieces of furniture long before she could walk. So the mom voice found its way into my life — typically when I couldn’t move fast enough to get between her and whatever imminent danger she was exposing herself to. So, I revised my promise: I would use the mom voice only when she was in danger. That lasted another few months, until I was pregnant again and needed to not chase my toddler around the house just to get her diaper changed or wrestle her into her car seat in frigid weather. I broke my promise, and now I break it every single day. Here’s the thing — I don’t even feel guilty. Somewhere between being a self-righteous new mom and now, I learned that the mom voice is an incredibly effective tool. Intentionally upping my volume a few notches every once in a while actually keeps me from totally losing my cool when my other parenting tools aren’t getting the point across or when one sister has a handful of the other sister’s hair in her fist. I don’t feel guilty for raising my voice or threatening loss of TV time every once in a while. It’s not my favorite way to parent my kids, but sometimes it is my only option. What I do feel bad about? How much time I spent judging other moms — moms I didn’t even know — for just trying to survive a Target trip or to keep their kids from running into a parking lot. So consider this my formal apology from one mom to another, and my promise to never make another stupid snap judgment about other mothers.